(Nanowerk News) Long hampered by high manufacturing costs and durability issues, fuel cell technology could overcome those obstacles and take a significant step towards mainstream adoption thanks to a finding by a Texas A&M University chemical engineering professor. Investigating the use of alternative materials as catalysts in fuel cells, Perla Balbuena, professor in the university’s Artie McFerrin Department of Chemical Engineering, has found a class of composite materials that show early indications of being just as effective — and even more durable — than the costly platinum catalysts typically used in fuel cells. The findings from her work, which is funded by the U.S. Department of Energy (DOE), appear in the January edition of the Journal of Physical Chemistry Letters. Balbuena views a model showing the detachment of a platinum atom (grey) from a nanocatalyst surface, driven by the presence of oxygen (red) and acid agents (yellow). Because of their potential as a clean source of virtually continuous energy, fuel cells are a chief area of interest to a wide variety of entities, including automobile manufacturers and the U.S. government, which has invested nearly a billion dollars in research and development of the technology. In a basic fuel cell, Balbuena explains, the platinum takes the form of incredibly small but expensive particles that are deposited on an electrode within the fuel cell. The electrode helps to trigger complex chemical reactions that ultimately result in the conversion of oxygen and hydrogen into water and electrical energy. Previous attempts to find more affordable alternatives for pure platinum catalysts have been unsuccessful, Balbuena says, noting that the nickel and iron-based alloy substitutes used were less durable, dissolving inside the fuel cell at a faster rate than even the traditional platinum catalysts. This dissolution occurs, Balbuena notes, because of an acidic polymeric membrane located next to the catalyst within the fuel cell. “This membrane, although necessary, creates another problem with regard to the design of the catalyst,” Balbuena says. “When nanoparticles of platinum or platinum alloys come into contact with this acid medium they can dissolve. The less ‘noble’ the metal, the easier to dissolve, and in that scale, platinum is the most ‘noble’ metal. When this happens, the catalyst can be negatively affected, rendering the chemical reaction less efficient. “This is the issue we are trying to address – trying to understand the reasons behind the dissolution of these metals and the possible solutions for this problem,” Balbuena says. Looking to overcome that problem, Balbuena, an authority on materials and catalytic processes, employed computational chemistry methods to investigate viable catalysts that would show enhanced performance as well as improved durability. In contrast to experimental models, computational chemistry makes use high-performance computers to find numerical solutions of fundamental equations involving interactions among atoms and electrons. These computational results translate into finding out the best materials for the desired task. It’s a pivotal first step in a process that saves scientists from costly trial-and-error approaches in the lab. Through that approach, Balbuena and her research group at Texas A&M were able to demonstrate the potential durability and activity properties of a new “core-shell” composite material that can serve as a catalyst within a fuel cell. The material, she explains, still uses platinum but less of it, meaning it’s cheaper. What’s more, in its core, the material uses other key elements in a way that ensures the core particles will not segregate to the surface and dissolve in the polymeric membrane. “In essence, we anchor less-expensive core elements that play a supportive role and let the ultra-thin platinum film on the surface exert its catalytic effect, that is to accelerate the desired reactions,” Balbuena explains. It’s a finding with significant implications for the widespread adoption of fuel cell technology. The DOE’s Solid State Energy Conversion Alliance estimates fuel cells will need to cost $700 per kilowatt to serve as a viable energy alternative. Current technology, however, costs nearly 10 times that amount per kilowatt. A more affordable, durable catalyst could help lower the cost of fuel cell production, says Balbuena, who notes the composite material she has found meets a set of standard properties that DOE has set for the durability and makeup of such catalysts. 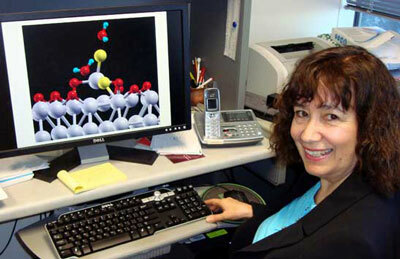 Having successfully met those criteria, the next step for the composite material, Balbuena says, is actual production and laboratory testing — aspects of the research that she is planning on exploring with potential experimental partners who have taken note of her findings and hope to begin building the new electrode catalysts in the near future.